The most striking result is the increase in the proportion of Americans who express strong doubt or rejection of the reality of global warming through their free associations. 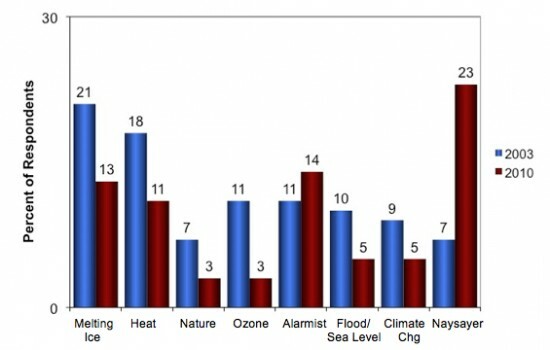 In 2003, only 7% of Americans provided “naysayer” images (e.g., “hoax,” or “no such thing”) when asked what thought or image first came to mind when they heard the term “global warming.” By 2010, however, 23% of Americans provided “naysayer” images. Over the same time, alarmist imagery (e.g., “death of the planet”) slightly increased. Both types of images became charged with more negative feelings over time. The graph below summarizes how Americans’ associations to “global warming” changed from 2003 to 2010 (more data can be found in the paper).